Angel food cake recipes are different than other types of cakes, such as buttercakes. 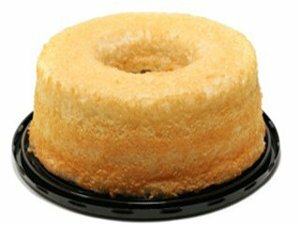 Angel food cakes are basically sponge cakes that have no fat or egg yolk in them; they are leavened with air and steam instead of the more common leavenings such as baking powder and baking soda. This means that the egg whites need to have the greatest amount of air beaten into them that's possible. When baking angel food cake recipes,use medium speed to beat the egg whites; the goal is not to beat them stiff, but to beat all the air into them that you can. You need to use a very large bowl to beat them in, because a dozen egg whites will fill up a large bowl after they're beaten to a soft peak. Using cold egg whites will help prevent overbeating-they have air bubbles that are smaller and sturdier compared to room temperature egg whites that produce large and fragile air bubbles. Using cream of tartar stabilizes the egg whites and makes the cake white. Your batter should not be stiff, and you should be able to pour it into the pan when done. Take special care when folding the other ingredients into the egg whites; if you arent gentle, theyll lose some of their volume. Make sure that all the utensils and bowls that you use with the egg whites are clean, dry and totally grease-free; the slightest speck of grease will keep the whites from gaining volume when they're beaten. Use regular granulated sugar and sift some with the flour to prevent clumping in the batter. Sugar that isnt mixed with the flour is beaten with the egg whites. Never just pour the flour into the egg whites; sift it one-quarter at a time over the whites and gently fold each one-quarter flour addition into the whites. Use a whisk or a rubber spatula (with no grease on it) to fold additions into the egg whites. Take your time and don't hurry. An angel food cake pan has a flat bottom that can be removable. It also has a tube in the middle of it that supports the cake while it's rising in the oven. Do make sure your pan is clean, dry and grease-free. Do not grease or flour pans that angel food cake is to be baked in; it won't bake like it should because, it's not able to cling to the sides and central tube to rise. The cake must be inverted immediately to cool when it comes out of the oven. If the pan doesn't have feet on it, put the tube over a glass bottle to support it. Cool the cake completely upside down so that it doesn't collapse when it's turned upright. Use a serrated knife with a sawing motion to cut angel food cake; a regular knife will make it compact and squish together. There is also a special angel food cake cutter that you can buy that look like a comb. An angel food cake should keep for at least 2 to 3 days, but they don't freeze well. If it's particularly humid you may notice that an angel food cake that hasn't been frosted develops a sugary crust on the outside of it; this doesn't hurt it or change the taste, it just makes it sticky. For angel food cake icing, try drizzling the cake with a glaze made with fruit, or just use a plain sugar glaze. Fresh fruit really goes great with angel food cake-don't forget whipped cream, too! 7-minute boiled icing or White Mountain frosting looks and tastes fantastic on angel food. Sprinkle coconut on the tops and sides and press lightly into the frosting to make a great special occasion cake. Just make sure to eat it all within 2 to 3 days; this type of cooked frosting breaks down in humid conditions. Buttercream frostings are also good on angel food. You can also split the cake into layers and fill with buttercream, whipped cream or a cooked filling.